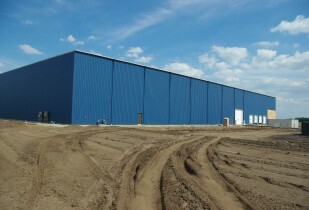 Projects | James Ware Construction Inc.
James Ware Construction, Inc. was awarded the contract to design and build a 120,000 square foot manufacturing facility for Burr Oak Tool, Inc. located in Sturgis, MI. The facility design includes paint booth, overhead crane, manager’s office, and temperature controlled communications room. During the design phase, we worked with the staff of Burr Oak Tool to develop floor and site plans to meet their current and future needs for function, accessibility, and security.The site presented a few construction challenges. In addition to logistical challenges for material deliveries, the site was also a farm field and crews worked for three weeks to remove topsoil and replace with fill dirt.The site includes 200 employee parking spaces, pull through the building for unloading material and loading of finished machines, four truck docks, and compactor for disposal of recyclable goods. The entire site was graded to correct drainage issues and to divert storm water away from the new facility.